Lane End Conference Centre has launched Japanese-style Bento boxes to help make clients’ working lunches at its conference venues even more productive. Bento boxes are ideal for working lunches at conference venues. They comprise a single-portion meal neatly packed in a box with individual compartments for each tasty option. The Bento lunch offered ideal-sized compartments with a lovely variety of tasty food options in each. Lane End Conference Centre has launched Japanese-style Bento boxes to help make clients’ working lunches at its conference and team building venues even more productive. 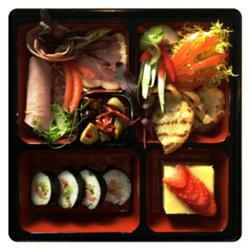 Bento boxes are ideal for working lunches at conference venues. They comprise a single-portion meal neatly packed in a box with individual compartments for each tasty option. Traditional Japanese Bento meals generally consist of rice, fish or meat and vegetables but any type of cuisine is available at Lane End’s conference meeting rooms. Delegates say the Bento meals make a tasty change to the usual cold buffets and sandwiches served during working lunches at other conference centres. The boxes also make Bento meals faster to serve and clear away than normal conference venue lunches – delegates simply place the lids on the boxes when they have finished eating. That means they can concentrate on the working element of the lunch more easily, without being surrounded by lots of messy plates after the meal. The Buckinghamshire-based residential conference centre and training venue was inspired to introduce Bento boxes by its sister company EJEF (the Euro Japanese Exchange Foundation). Bento box meals are readily available in many places throughout Japan, including convenience stores and Bento shops. Many Japanese households make up their own meals. It is still common for the Japanese homemakers to produce carefully prepared lunch boxes for their spouse and children. Some of the first guests to try Bento box lunches at Lane End were delegates from a number of venue-finding agencies. They were on a familiarisation trip arranged by Moulden Marketing of Bourne End, Buckinghamshire. Lane End Sales & Marketing Manager Heni Fourie hosted a Bento box lunch meeting for them at the centre’s newly refurbished Wycombe Court conference venue and management training centre. “Our team of chefs has taken this concept and developed a range of Bento-style lunch options for delegates,” he said. “There are hot and cold options to choose from and something to suit every diet. They are proving to be very popular with everyone who has tried them,” he added. One guest from Town & Country Conferences, Barbara Wheeler, said: “The Bento lunch offered ideal-sized compartments with a lovely variety of tasty food options in each. The launch of Bento boxes coincides with completion of major refurbishments at Lane End. Bento boxes are a similar concept to the Tiffin lunch boxes of India. Bento traces its origins back to 12th century Japan when meals of cooked and dried rice were stored in small bags. Bento culture became more widespread during Japan’s Edo period (1603-1867) when travellers would carry meals in woven bamboo boxes. The tradition of Bento boxes continued throughout the 19th and 20th centuries, increasing again in popularity from the 1980s onwards. Bento has enjoyed a big resurgence in popularity in Japan over the last 30 years thanks to the advent of microwave ovens and significant growth in the number of convenience stores. Lane End is a leading international conference centre, welcoming delegates from all over the world to its dedicated business facilities. It is just an hour’s drive from the centre of London and its major airports, making it an ideal UK conference venue for companies with delegates arriving from international destinations. Lane End has 34 conference meeting rooms and 104 en-suite bedrooms, all split between five newly refurbished buildings. That makes it easier for companies to book an entire building at the 26-acre site, ensuring they have complete privacy and all the facilities they need. For further information about meeting rooms for hire, please contact Sales and Marketing Manager Heni Fourie, telephone +44 (0)845 521 3013. Delegates enjoy hi-tech conference facilities, ample free parking and free broadband access on-site – all within swift and easy reach of the capital.